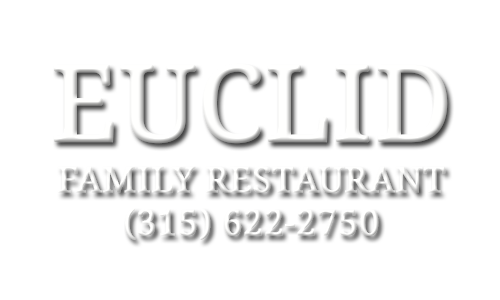 Book your next special occasion with Euclid Restaurant! Whether it is a small intimate occasion or a company gathering, Euclid is the perfect choice for your event needs! We have two separate banquet rooms. Our first room is for smaller gatherings and can accommodate up to 35 guests. Our second room is a larger venue and can accommodate up to 100 guests. All Prices are Plus 8% Sales Tax and 20% Gratuity. Other menu options are available. $13.99 per person plus tax and gratuity. $10.99 per person plus tax and gratuity. $12.99 per person plus tax and gratuity. $14.99 per person plus tax and gratuity. Broiled Chicken Breast Sandwich with Melted Cheese and Bacon. All prices are for a minimum of 20 or more people. All prices are Plus 8% Sales Tax and 20% Gratuity. Other menu options are available. Light Dessert $1.50 Per Person. $22.99 per person. Plus 8% tax & 20% gratuity per person. $17.99 Plus 8% tax & 20% gratuity per person. $19.99 Plus 8% tax & 20% gratuity per person. $13.99 Plus 8% tax & 20% gratuity per person. $16.99 Plus 8% tax & 20% gratuity per person. $14.99 Plus 8% tax & 20% gratuity per person.